A tight edit of 10 cocktails plays to theme of Spirit House. 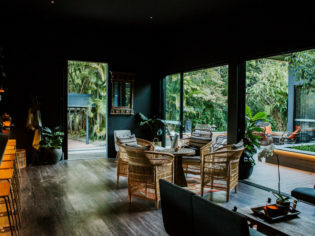 Celeste Mitchell skips the lengthy reservations queue and heads straight to the new bar within the grounds of hatted Sunshine Coast restaurant, Spirit House. When a well-regarded restaurant with a longstanding reputation – not only on the Sunshine Coast but across the country – opens a new bar, it’s very exciting news. After calling Spirit House to confirm the bar is open to the public and not just a debonair drinking den for diners or for private events, a Friday-night mates’ date was swiftly arranged. The entrance, passing through lush tropical gardens, always brings with it a rush of anticipation, but this afternoon it’s all the more striking as we face the architectural lines, ink-blue façade and open deck of Hong Sa Bar, where couples recline as the day ekes out the last of the winter sunshine. We enter through the orange barn door to be greeted with a friendly smile and an invitation to sit wherever we like. The black walls and bar are balanced with antique timber tables, grey lounges, and cane chair (photo: Krista Eppelstun). After the onslaught of white-on-white minimalism of the last few years, it’s nice to feel cocooned within the dark interior. The black walls and bar are balanced with antique timber tables, grey lounges, and cane chairs. Towering fiddle leaf figs add pops of green. But to the menu. A tight edit of 10 cocktails plays to theme, such as the Singha Mojito spiked with lemongrass syrup, but I find it impossible to go past a Tom Yum Bloody Marys. And while the drinks list is enough to excite, we’re really here for the food – a bar-food menu independent of the restaurant. We snack on peanuts with makrut (kaffir) lime, coriander, salt and chilli, and salmon straws with wasabi mayonnaise, but a fumble with our order means we also score a complimentary DIY miang platter, allowing us to wrap up ginger, lime, peanuts, fresh chilli, toasted coconut and tamarind sauce in betel leaves. It’s interactive, packs a punch and sets a tone I hope will prevail over the whole experience: unfussy, original and lipsmacking. Spirit House Hong Sa Bar opens in Yandina, Queensland. Over the next few hours, a steady stream of pre-dinner drinkers rotates as we work our way down the list of Thai pub grub, made more appealing by the pub-like prices. Ginger and black pepper chicken wings heat the lips and the Thaicini green-curry rice balls are a fun play on the Italian street food classic, though the Massaman lamb pies and Chiang Mai sausage skewers are underwhelming. The service slips as the night matures but, given we’ve arrived within the first six weeks of opening, I’m hopeful it will improve. Hong Sa provides the perfect gateway to Spirit House and a secluded spot for a drink, but can’t and shouldn’t take the place of the restaurant. However, I am trying to think of a reason to book the stunning private dining room attached to the bar. Then I’d have the best of both worlds. The verdict: A great spot for pre- or post-dinner drinks; as the weather warms and word gets out, service will hopefully keep up with the pace. We rated: The Tom Yum Bloody Mary and secluded vibe. We’d change: The service was a little slow after the first round. Notes: We paid $207 for six share plates and several rounds of drinks for a party of four. Arrive early to score a seat on the deck.